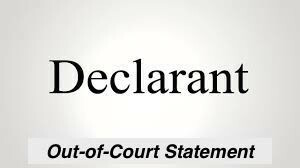 Classic Hearsay: Declarant's Out-of-Court Statement Offered to Prove the Truth of the Matter Asserted - В сложной финансовой ситуации приходит на помощь кредит наличными в Казахстане. I previously discussed the concept of hearsay and that hearsay is inadmissible evidence at trial. There are exceptions to hearsay—such as the business records exception or admissions against a party opponent—that I have written about since they are important hearsay exceptions at trial that come into play to admit evidence at trial. What is classic hearsay? Hearsay is simply an out-of-court statement (written or oral) introduced at trial to prove the truth of the matter asserted in the out-of-court statement. “[W]hen the only possible relevance of an out-of-court statement [introduced at trial] is directed to the truth of the matters stated by the declarant, the subject matter is classic hearsay even though the proponent of such evidence seeks to clothe such hearsay under a nonhearsay label.” See Summerall v. State of Florida, 40 Fla. L. Weekly D1603b (Fla. 1st DCA 2015) quoting Keen v. State, 775 So.2d 263, 274 (Fla. 2000). The criminal case of Summerall illustrates a classic example of classic hearsay. This case involved a domestic dispute between a former boyfriend and girlfriend. The boyfriend was arrested. During direct examination by the prosecutor, the girlfriend (victim) testified to the content of a phone call she had with her (criminal defendant) former boyfriend’s mother. She testified that before her former boyfriend arrived at her house, she received a call from his mother. When the prosecutor asked the girlfriend what her former boyfriend’s mother said on the phone call, the defense objected as “hearsay.” The trial court overruled the objection and allowed the girlfriend to testify. The girlfriend testified that her former boyfriend’s mother told her to call the police because the boyfriend had a gun and was going to shoot her. But, there is a problem. The girlfriend’s testimony was classic hearsay as she was testifying to a declarant’s out-of-court statement (what her former boyfriend’s mother said to her on the phone) offered to prove the truth of the matter asserted by the declarant (that the girlfriend should call the police because the former boyfriend had a gun and was going to shoot her).